No do not panic… you have not missed game one (I am still waiting for the write-up on that one), but we are now into the second month of our Warzone League. And I did not want to keep you waiting too long so here is the first AAR (Imperial vs. Dark Legion). Both forces fielded units that are not seen on the tabletop too often (Golden Lions and a Praetorian Behemoth) and it was actually them who decided the game. It can all be found here or by going to the March entry for Warzone League menu at the top of the page. Enjoy! 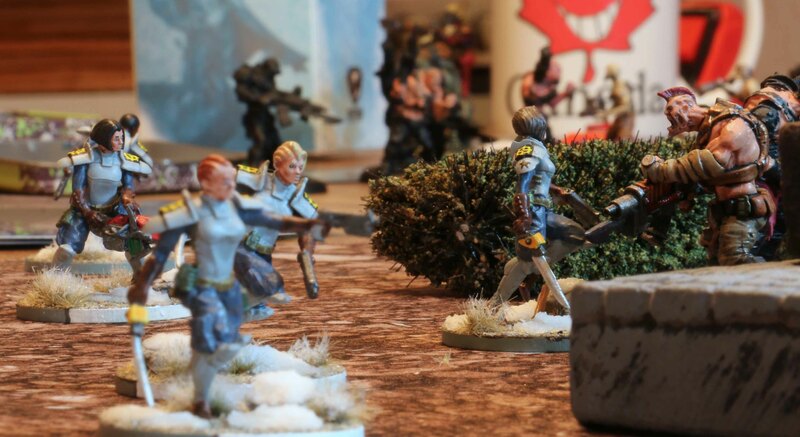 Just short note to let you know, that the after action reports for the third and forth February games of our Warzone: Resurrection League are not online, including the table with the standings after the first month. They can all be found here or by going to the Warzone League menu at the top of the page. The sub page for march has also gone live, so for those who want to know who plays who this month, you can go there as well. But with the first games taking place this weekend, you should not wait too long for the first game reports anyway! This month sees the start of the next installment of our Warzone League. Now last season there was five us. Which meant it was gritty, hardly representative and over too fast. In other words, it was not much more than a few friendly matches. So I just featured some reports of the games I played in the league. And while we are still not playing for anything but glory, there are now ten of us. So this will last much longer and be much more representative. So I felt, it would be a shame if I just left you with my reports again and talked the others into supplying some reports of their matches as well, to feature them on this blog. To do all this, I set up a sub page of this blog to host the Warzone League games (although you can also access it directly through the NavBar at the top. I will also post a short article here on the main page to give followers a short heads up, that there is something new when there is a new report. Anyway… last Sunday saw the opening match of the league with a game of Andreas Dark Legion vs. Björns Bauhaus. so who won? Lets click here and find out! Enjoy! Last Sunday Andreas and myself met for the final game of our Warzone mini league. And mini it was indeed, for this season there were only 5 players which meant a meagre 4 games for each of us. I actually planned to post this a couple of days ago but I was down with a flu most of tis week, so it took a bit longer. Also my apologies for the report itself. The flow of the game was pretty strange, so it is a bit hard to report on it. Hope it will still make sense to you! The game was played out in an abandoned mining outpost. 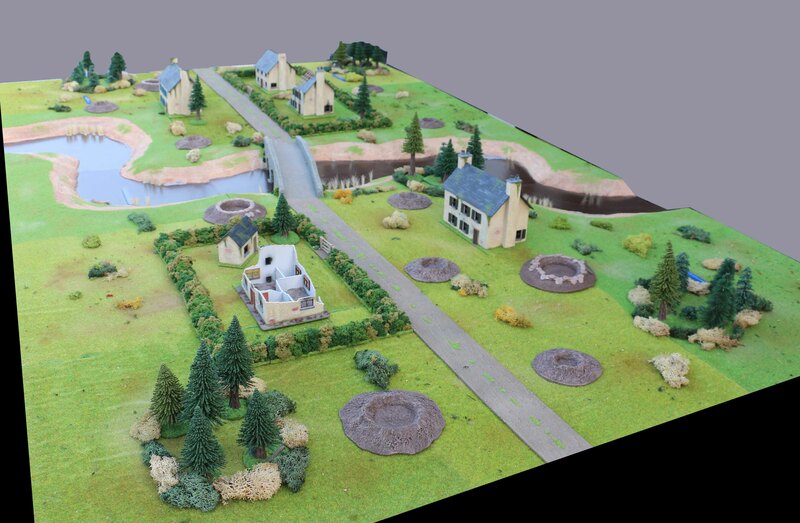 Most of the terrain was open, with three large buildings, a large tank and acid waste canal, some crates, bushes and a few fences (essentially these blocked off the far left of the table). Our primary mission was a resource grab. Meaning there were three resource marker along the middle line of the table, of which we had to get two off to our deployment zone to win. We also had secondary objectives. In Andreas case he would have to have troops on the highest roof by the end of round eight, while I had to find an ammo dump at one of the three locations already markered and blow it up. In addition we both also had corporate agenda objectives. I would have to kill three times as many points with one of my squad leaders as he was worth himself, while Andreas had to lose one of his (both Leaders had to be written down before the start of the game). Lets just mention here, that neither achieved his mission. Mine was killed the first time he was shot at and while I fired a lot at Andreas Squad Leader he simply would not die. So what did we field? Andreas was playing Dark Legion: A custom close combat Necromutant Warlord led his force consisting of two squads of Undead Legionaries (without heavy weapons and led by Necromutants), two squads of Necromutants, 4 Nasca Razides (two on their own and two in one squad) and two Necrobeast Riders. 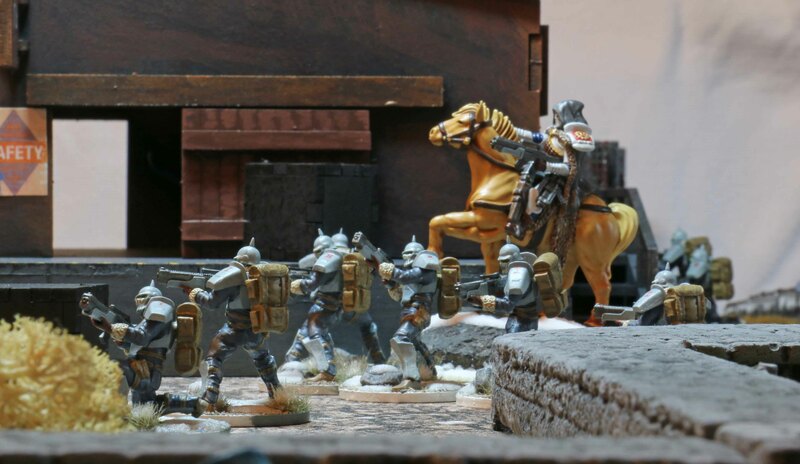 As usual I was playing Bauhaus: My custom close combat Juggernaut Warlord, two 5-women squads of Etoiles Mortants (each with a flame thrower), a 10-men squad of Hussars (with two LMGs) lead by a Venusian Kaptain, a 7-men squad of Hussars (with one LMG) and three 5-men squads of Venusian Rangers. I won the set-up initiative, but chose to let Andreas deploy first. He spread his troops out evenly in his deployment zone. My large squad of Hussars deployed in the middle of the board, while the small one deployed on the left flank together with the Warlord. Since Andreas had no infiltrating troops my Rangers deployed their booby traps in the middle of the board. 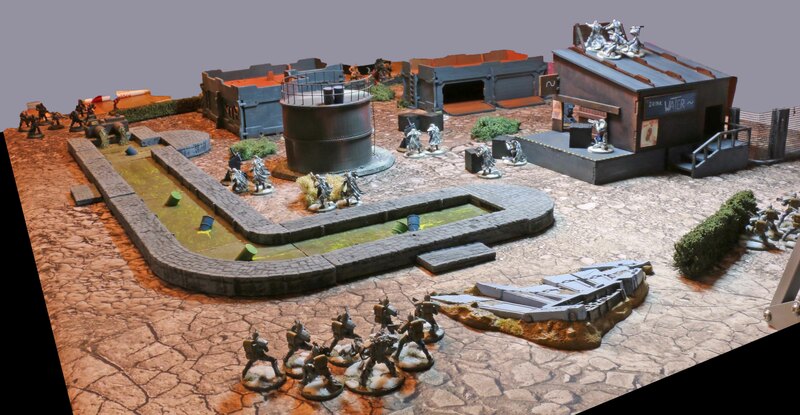 One squad each deployed right on the left and centre objective markers, while the third deployed 4 men on the highest roof, with the last Ranger in contact with the right hand objective marker. The game started with Andreas playing a strategy card which meant that unless my Troop types (Hussars and Etoiles Mortants) used just one action this round, they would take automatic hits and therefore potential damage. On this first round I therefore just advanced my Hussars slowly and decided not to deploy my Etoiles at all. None the less Andreas put a lot of his troops on sentry to safeguard against a deployment of the Etoiles Mortant. 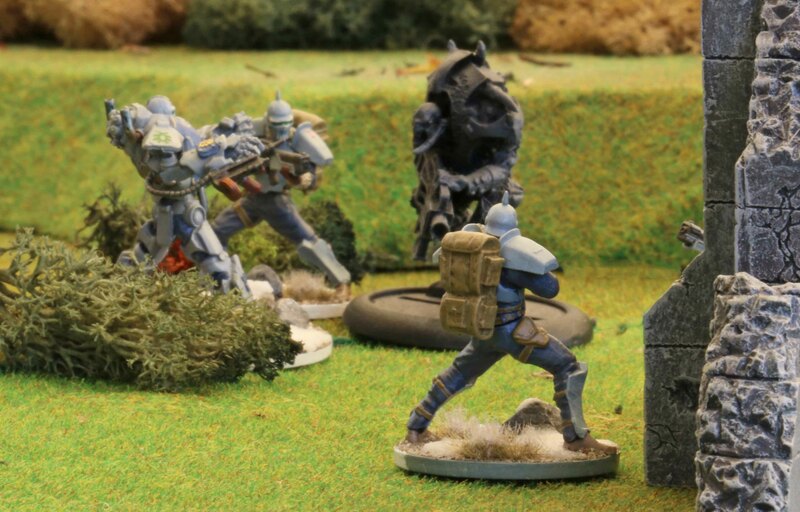 The unit of Rangers on the right saw the trooper in contact with the objective marker carry it off into the warehouse. His comrades on the roof either had no targets in range or in sights, so two of them just went into sentry as well. There was also an artillery strike card I played on the Dark Legion deployment zone. This was cancelled by a card Andreas played, at the price of his Warlord taking a wound (later in the game he would use the same card once more, again rolling bad and taking a hit with his Warlord). The Venusian Rangers on the left picked up the objective marker and started making for the rear. This did not work out too well. 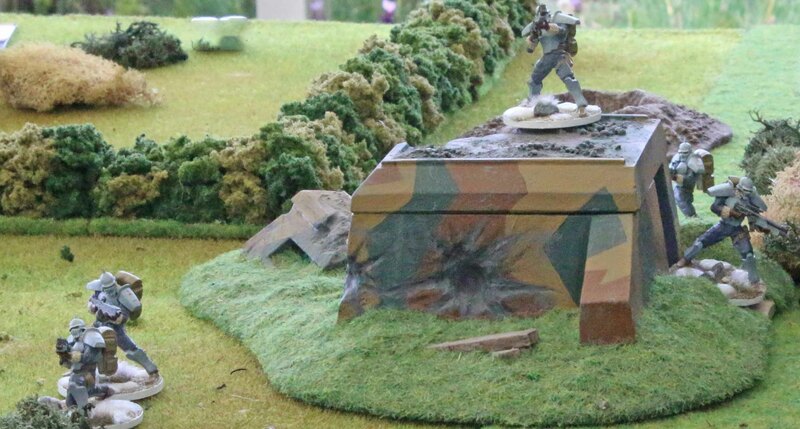 While they were at the extreme end of the weapons range, three of them were still killed by weapons fire (including the squad leader carrying the objective marker by a natural one on the to hit roll [which allows no saves at all]). 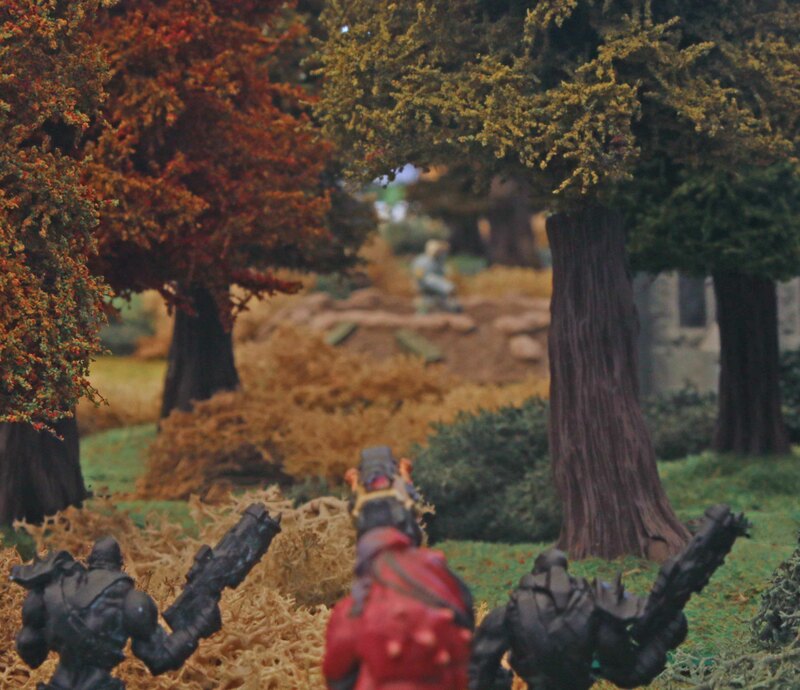 The Venusian Rangers in the centre had already lost one of the two men in contact with the objective marker, when they found that this was the location of the ammo dump as well. The remaining trooper just chose to set explosives to it and make for safety. Before the end of the round, they would see two more of their squad killed (again the squad leader by the roll of a natural one). The round ended with the Necrobeasts climbing the roofs of the near buildings. The two Venusian Rangers on the roof used their Sentry to fire at one of them and even though they had no AT weapons, they even causes one hit, which was unfortunately repaired at the beginning of the next round. The next round saw Andreas win initiative again. Before much could be done, the Necrobeast charged forward (destroying two of the booby traps in the progress). One of them charged and killed the Venusian Ranger inside the Warehouse who was carrying the objective marker. 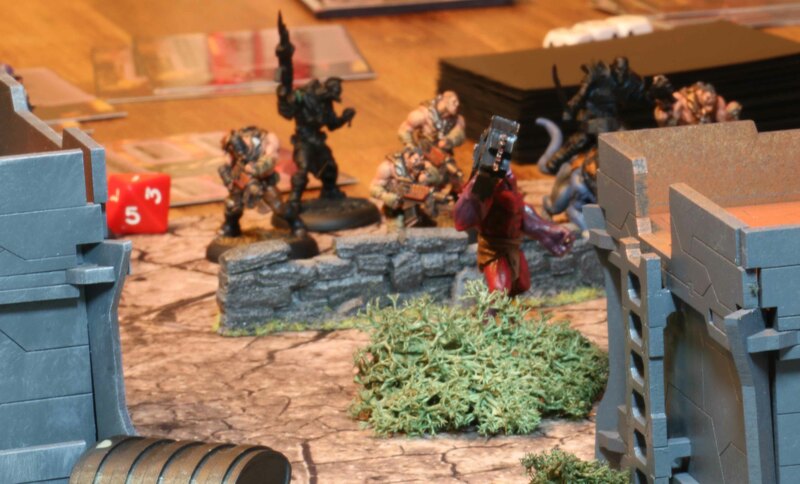 The other Necrobeast rider fired a few shots at the Venusian Ranger on the roof, killing the Squad Leader (guess what he rolled… a natural one). I played a card on the Necromutants on the left flank that would see each of them killed generate a supply token for my Kaptain. With this in play, the Etoiles Mortant deployed near them and killed four of them, two Undead Legionaries from the adjacent squad and a Nasca Razide. The other unit of Etoiles would later in the same round deploy in the centre of the Dark Legion deployment zone taking out 5 Undead Legionaries three Necromutants and damaging another Nasca Razide. This now forced the Dark Legion to clear them out, which took most of this and the next round, but eventually saw all of the Etoiles dead with them “only” being able to kill one more Necromutant. In the centre the Hussars now tried their best to kill or at least tie up the Necrobeasts. The Kaptain used two of the supply tokens to give the LMGs At capability for this round. I also raised their rate of fire, but out of their six shots, they failed to even score more than a single hit. To add insult to injury, this hit did not even cause damage. Two of the Hussars ran into the warehouse. One to carry off the objective marker the next round, the other to tie Necrobeast rider up in close combat. 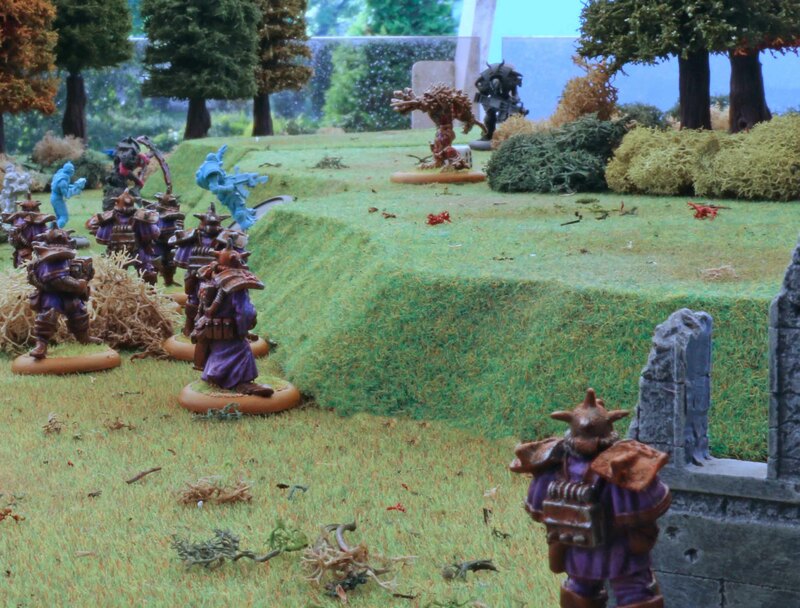 Outside two of the other Hussars (they got the other two supply tokens to give them AT capability) fired at the other Necrobeast, but while they hit, they failed to do damage. One more Hussar and the Kaptain charged the Necrobeast in the open, but again failed to do damage. The rest of the squad just advanced towards the objective markers. The Venusian Rangers from the centre and left squad had taken more damage from the Dark Legion troops in the deployment zone (before the second unit of Etoiles Mortants dropped) which saw the centre unit annihilated and the left one reduced to one man who ran away. The other units just advanced as best as they could, with the Hussars trading some shots with the Necromutants left by the first Etoiles Mortants attack. Now the next two rounds are hard to describe. As I said before, it consisted a lot of the Dark Legion mopping up my Etoiles in their deployment zone. The Hussars slowly battled it out with the Necrobeasts, but while they did no damage, they started falling one by one (including the Kaptain). This was only made worse by the fact that they became subject to the same card they had been at the start of the game (the one that meant they potentially took damage if they use more than one action). Having to secure at least one of the objective markers and having to fire at the advancing Dark Legion troops, four of them had to take this risk. While for minimal gains, three of them actually took damage and died. Once done with the mopping up, the remaining Nasca Razides and Necromutants moved forward. 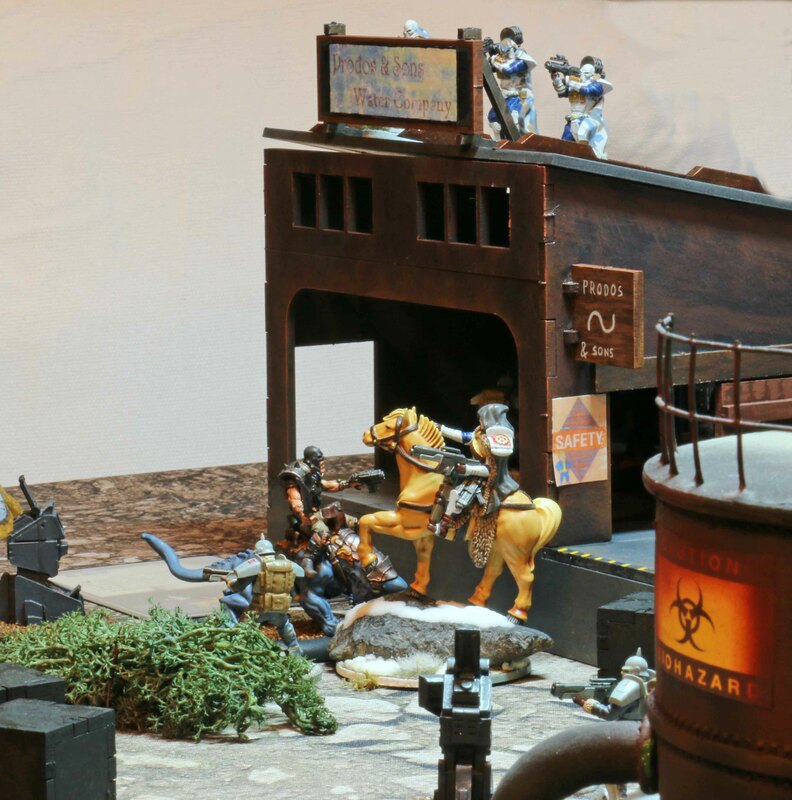 One of the Razides was killed the other damaged by the remaining booby trap, but two of the Necromutants threw grenades at the Hussars. The one who targeted the Hussars in the centre did surprisingly little damage for the high strength of the grenades, but the one who targeted the ones on the left wiped out virtually the whole squad. No matter what the grenades also reduced the attack skills of the remaining Hussars to half for the rest of the round. And one by one the Venusian Rangers on the roof were also killed by fire. In the following round, the few remaining Hussars managed to take out the two Necromutants who had attacked with grenades. 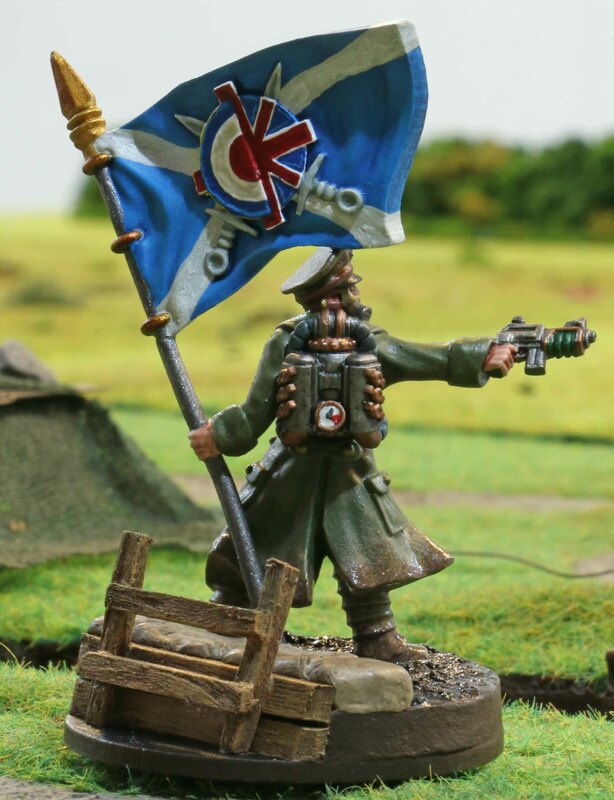 The fleeing Venusian Ranger, who had previously recovered his nerves, returned and carried one of the objective markers off to the deployment zone. At this point we were both left with shambles of our forces. I only had my Warlord, the odd Hussar and one Venusian Ranger. Andreas had his Warlord, the Necrobeast Riders, two Nasca Razides (one of them damaged) and less than a handful Necromutants and Undead Legionaries. At this point I had already completed my secondary objective, but I held no illusions that I could prevent Andreas from achieving his. Neither of us could complete the primary mission (I did not have the troops left to carry a second marker to my deployment zone and all the markers were too far away for Andreas to do so). So at this point, we decided to call it a day and agreed on a draw. So this was my last outing in this mini league. With a win, two losses and a draw this left me on a shared third place together with Andreas in the total ranking (not too representative with so few games anyway). And this was also the last outing for my Bauhaus troops for the near future (unless for some non-league games). For the next season, starting in February, I decided to play Imperial. So you can expect me to showcase some of those troops soon. Last Friday we got together for a big 4 player game of Warzone. So what did we play? Major Richard Meier was not too happy. Just last week a Mishima force had landed in the regions of Venus guarded by Bauhaus 274th Garnisions Regiment. The had caught the roops in the region in the rear, their lines being orientated towards the Dark Legion citadel close by. As usual when the enemy managed to break the Bauhaus lines in the cold regions of Venus, it fell to the 23rd Gebirgssturm Brigade to push them back and this time Meiers battalion had drawn the short straw. His attack was scheduled for tomorrow and now that they were making final preparations he was called to a meeting with the Fenrisbrigades commanding officer. He did not like having his preparations interrupted at such a moment. But what he liked less was an operation being called off. He really hoped, that his was not what this meeting was about. 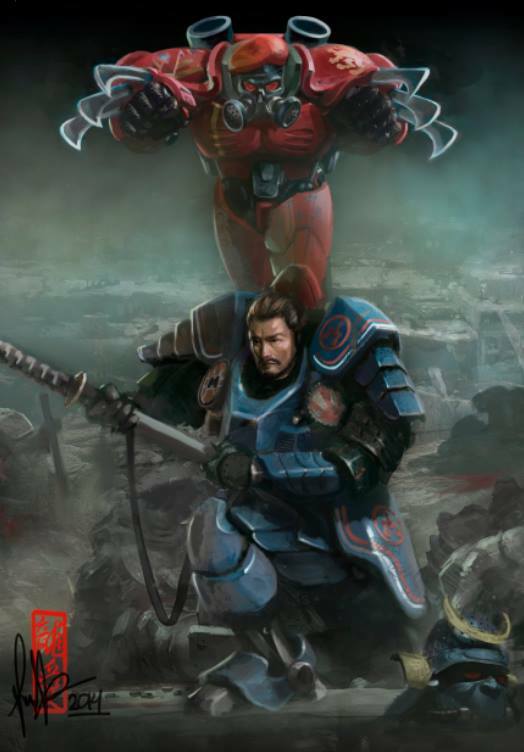 Mishima: A custom Demon Hunter Warlord, a squad each of Ronin Samurai, Hatamoto, Demon Hunters and Shadow Walkers, as well as two Meka suits combined into one squad. Dark Legion: Galgotha as Warlord, two squads of Undead Legionaries (with Necromutant Leader) and one of Necromutants, two 2-men squads of Nasca Razides and a two-men squad of Praetorian Stalkers. Brotherhood: A custom Sacred Warror Warlord, one squad each of Troopers (with Inquisitor leader), Inquisitors, Mortificators and Guardiani Oblati as well as two squads of Sacred Warriors (one led by Lukas). 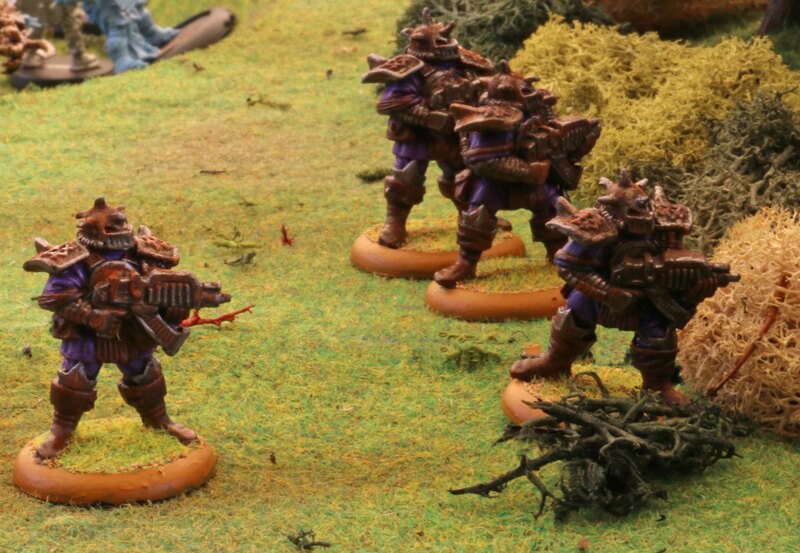 Bauhaus: Custom Juggernaut Warlord, two squads each of Hussars and Etoiles Mortant, one squad of Venusian Rangers and four Vorreiter combined into one squad. The table was a rectangle (2,5m x 1,5m) cut in half by a river which in turn was spanned by a large stone bridge. There were a few small woods and bushes on the board. Also some houses (two of them ruins) and gardens lined by hedges. We rolled for missions and got an Ambush. Team evil chose to be the defender, so team good had to place our units first being the attacker (pretty strange, but that is the rules). Each of us had to have one unit within 6″ of every board edge. Ingo put his Warlord and Sacred Warriors on one of the long edges with the Inquisitors in the near corner. Going clockwise from there, came my Vorreiter on the short edge. 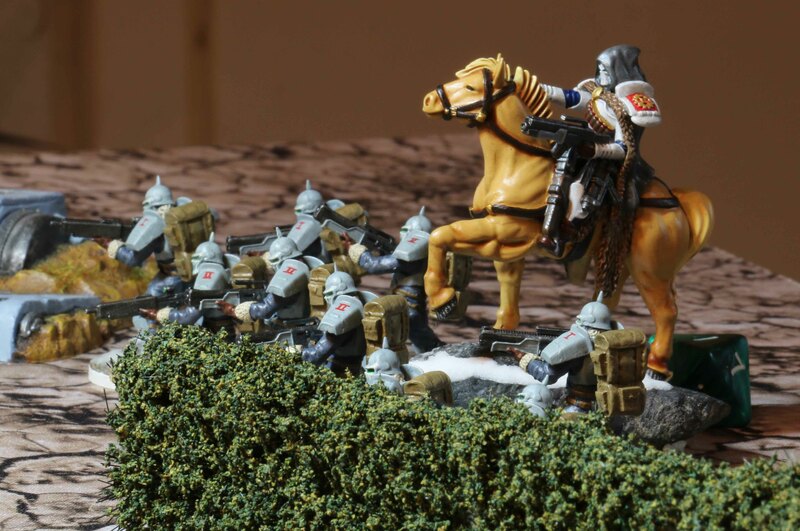 On the next long edge, but on the other side of the river came one squad of Hussars, the Troopers and the smaller squad of Sacred Warriors in the corner. My other squad of Hussars and the Bauhaus Warlord were in the remaining corner. 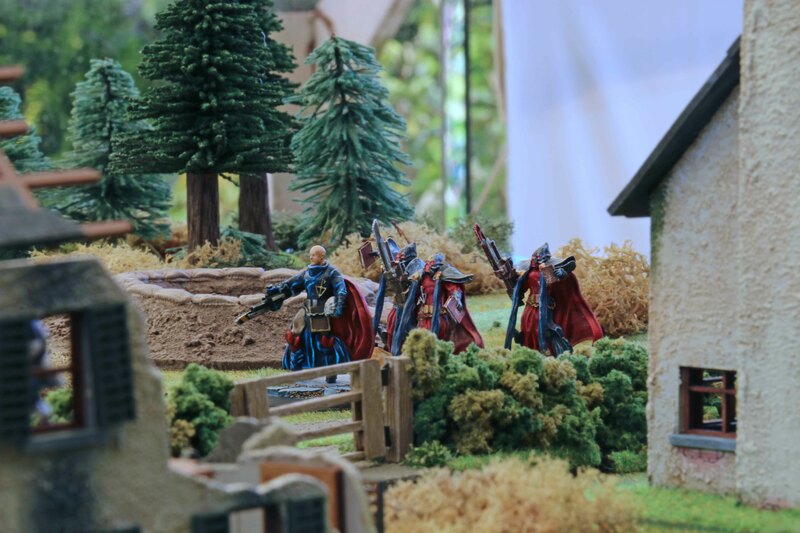 Team Evil had to set up all units with at least 2 men of every squad within 6″ of the table centre. So essentially they all huddled on the bridge, in the river and on its banks. The only exception were the Demon Hunters. On account of them being Dispersible (they double the range for their coherency) they formed a long line from the deployment zone pointing towards the Bauhaus Warlord. All in all there was a distinct emphasis on that flank with almost all units of team evil oriented that way. Next came our infiltrating units. 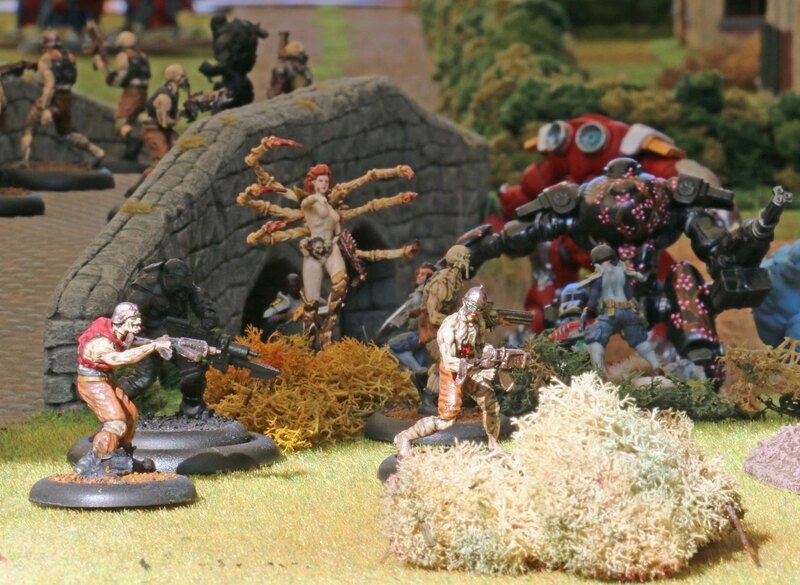 The Venusian Rangers deployed in the ruins on the neglected side of the boards, while the Mortificators deployed near the Bauhaus Warlord in the woods and hedges. The objective was for team good to reduce team evil to about ¼ of its initial forces by the end of turn 5. We all had a Corporate Agenda mission as well, but we all completed ours so I am not going to go into that. We had decided, to roll for initiative within a team and then had the winner roll for team initiative, with the order of activation alternating between the teams. On the first round Ingo won. Up next would be Arnd, then me and Andreas last. Ingo began with his Warlord, who played a card that would prevent Galgotha from using her skills (including the one which would deny one of our units all cover). After moving forward a bit, he called in an artillery strike on the bridge, which killed one Ronin Samurai, two Undead Legionaries and caused two Nasca Razides from one squad a wound each. Up next came Arnd. He wanted his Meka suits save from harm and played a Snipe of the Cobra card on my Venusian Ranger with the rocket launcher. He failed his armour test and our best anti vehicle weapon was gone (not that it would matter too much). But he also activated his Demon Hunters and the squad leader and the other Hunter hammered my Warlord with their HMGs. Inspite of a massive 7 or 8 hits, the Bauhaus Warlord saved all but one (and that one would later in that round be healed by a special piece of equipment build into his suit). Now I activated my Hussars near the Warlord. It was obvious, that my Warlord was going to be the prime target so they moved into position to screen him. Three of them also managed to get some shots off at the Demon hunters and inspite of their good armour and high Heal skill, they even managed to wound the trooper. Now it was Andreas turn and he advanced his Necromutant squad at my other Hussars. They started firing at the closest Hussar, but he managed to take shot after shot with his armour. Frustrated Andreas shifted his fire on the squad leader, only to have the seemingly bulletproof Hussar throw himself in harms way and take the shots for his NCO. At this point, it was Ingos turn again. He activated his larger squad of Sacred Warriors to move them forward and protect his Warlord, but Lukas also used a skill which would deny the Mishima Meka suits cover for the rest of the round. Arnd found most of his troops boxed in on the bridge and decided to activate his Hatamoto and move them towards the riverbank. Now I decided to go Warlord hunting myself and Rapid Deployed my first Etoiles Mortant squad close to Galgotha. Unfortuntely for them, the Mishima Warlord had an early warning system and saw them drop from the skies. So he was able to fire at them before they do anything. Two of them took the hits on their armour, but the trooper with the flamethrower died. Her mate picked up the flame thrower though and fired it at both enemy Warlords. They had enough troops around who willingly sacrificed themselves, but none the less this still killed two Undead Legionaries and two Ronin Samurai. The remaining three Etoiles Mortant charged Galgotha in the rear and managed to cause her two wounds. When Andreas activated, he found most of his troops in no position to come to Galgothas help, so he actived his two Nasca Razides close by. One went into Sentry, while the other shot at the Hussar who had so far managed to survive all the fire coming at him. This time it was too much, but we calculated that it had taken well over 20 shots (with more than half of them being hits) to kill him! 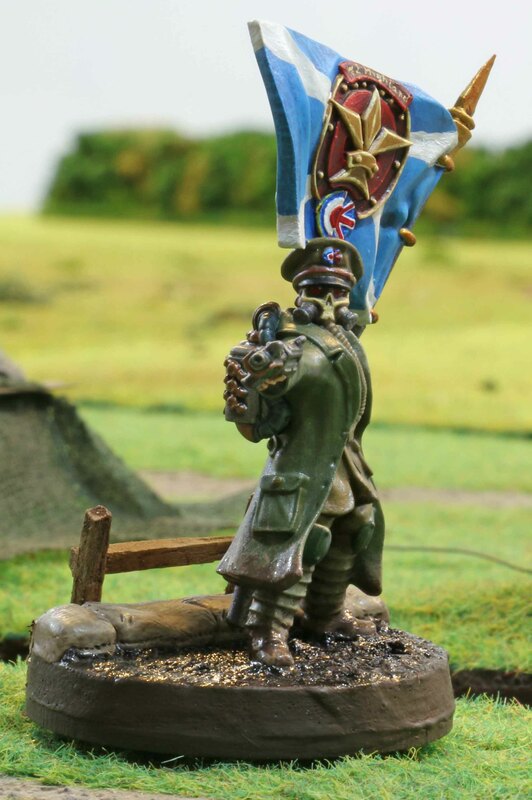 Unfortunately he also managed to kill the Hussar squad leader. Ingo now actived his Inquisitors. They advanced towards the enemy and their squad leader cast a spell on one of the Meka suits damaging it in the hull. With things heating up around them, the Mekas decided to charge the Etoiles Mortant and whipped them out in close combat. While charging through the river, the one that had already been damaged took some more damage to its legs. With things having gone well for the first Etoiles attack I decided to deploy the second squad as well. But their combat drop did not go as well. They scattered into the Razides and being stunned were unable to do anything else. In turn they would be cut up by the Razide who had gone into Sentry and by Andreas now activating his Undead Legionaries. To add insult to injury, one of the Etoiles was also turned into an Undead Legionary when she was killed by the Necromutant squad leader. At this point, Ingo advanced his Troopers and managed to get some shots at the Necromutants (but I cannot tell to what end, since I was away from the table for a few minutes). Arnd also advanced his Mishima Warlord towards the Bauhaus one. I activated my Warlord and he fired his HMG at the Demon Hunters, killing the one who had already been wounded and wounding the squad leader. Andreas advanced this other Razides out of the river and towards the Bauhaus Warlord with guns blazing. But failed to wound him, but they wiped out two Hussars close by. The next activation saw Ingo advance his remaining Sacred Warriors and Arnd his Remaining Ronin Samurai. Now the Vorreiter charged forward and hammered the Meka suits with their HMGs. Andreas tried to prevent this by playing a Dark Legion card that would keep me from firing, but Ingo managed to take that out of play with one of his cards (never have I been so happy to see Brotherhood on the table!!!). Unfortunately they spread their damage on virtually all locations, but destroyed the already damaged one. Andreas advanced his remaining Undead Legionaries. The rest of the first round was quiet uneventful, with the remaining troops either advancing or my Venusian Rangers firing their rifles at the Legionaries on the bridge, killing one. 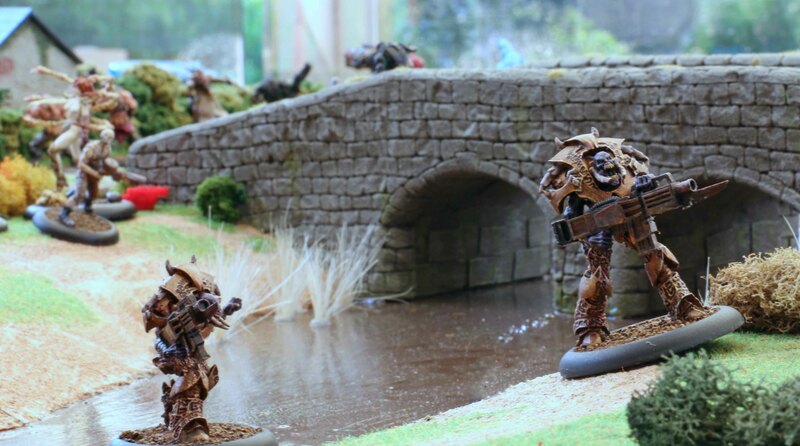 The Praetorian Stalkers deployed on the side of the river where the majority of the team evil troops were. Before the next round began, Arnd placed markers for his Shadow Walkers amidst the pines close to the Bauhaus Warlord. Now it would be crucial who would win the initiative for him to survive. But Arnd won the initiative, so this would be hard. Next would be me, followed by Andreas and Ingo coming last. 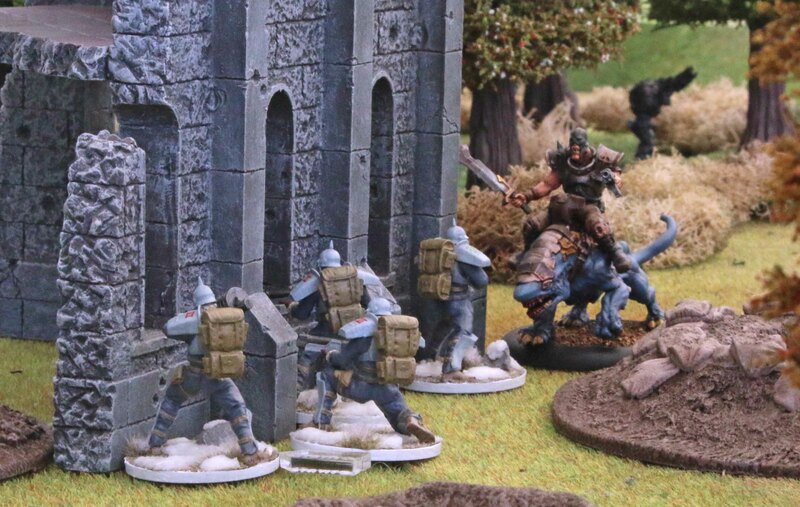 Obviously Arnd activated his Shadow Walkers first and their markers were replaced with actual miniatures. He played another Snipe of the cobra on the Hussar blocking their approach on my Warlord killing him. Now the two Shadow Walkers charged my Warlord, scoring seven hits. This was though luck, since their attacks do not allow for armour saves (unless it is impenetrable armour, which has to be re-rolled on a successful test) or heal rolls. But he managed to save three of them. This cost him all his four wounds, but then the chemical resuscitator kicked in and he regained his last wound, keeping him alive! It is amazing how good my dice were that day! Up next came m Vorreiter. Their initial goal was to shoot the remaining Meka, but that one was covered by the two Nasca Rizides close by and hard to hit. So the first two Vorreiter shot at the Razides, killing them both. Now the other two were free to shoot at the Meka, hitting it in the rear and leaving it barely intact. Unfortunately, their fire also killed the last remaining Etoiles Mortant, but a small sacrifice it was. 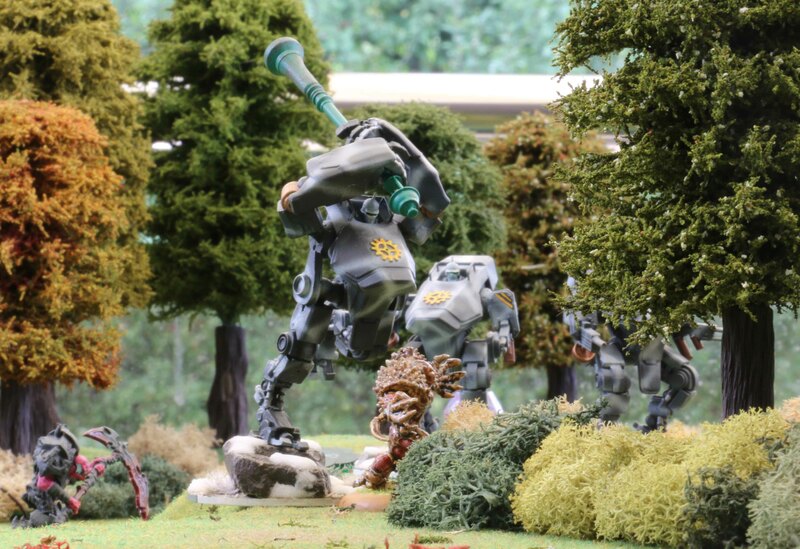 Andreas used a card to remove his Praetorian Stalkers from the board and Re-rapid Deploy them close to the Vorreiter. Their drop went wrong, but they did not scatter too far. 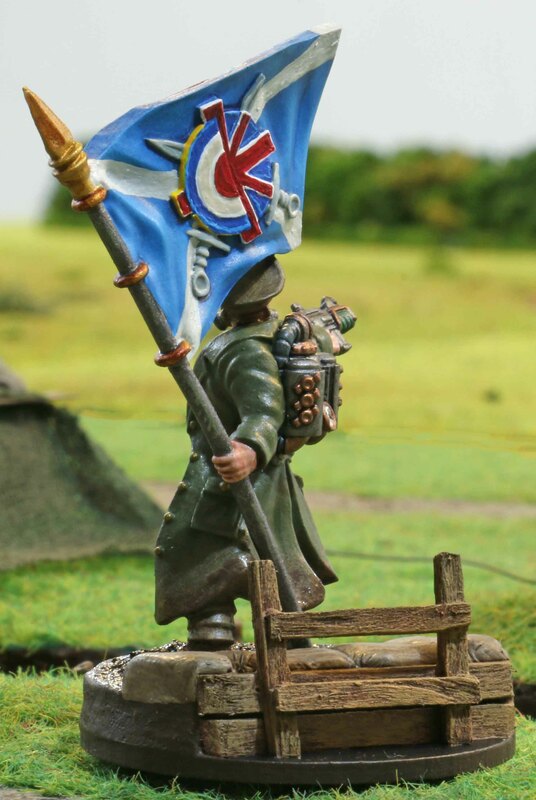 One of them was close enough to use this flame thrower on two of my Vorreiter. Just like I had seen in my previous game, these weapons are so strong, they cut through any vehicles armour and it was no different this time… both Vorreiter perished! The other Stalker fired his HMG at the Vorreiter squad leader, but only managed to damage his bike. Ingo activated his Inquisitors, again all they could do was advance and have the squad leader cast a spell at the Meka, but damaged as it was, this was enough to destroy it. There was not much, that Arnd could do, so he advanced one of his Demon Hunters. I activated my Venusian Rangers who moved out of the ruins and fired at Galgothas back, causing her one more wound (she was now down to only one). Andreas activated his Necromutants who cut into Ingos troopers and my Hussars with their fire. Ingos Troopers also took a heavy beating, loosing all men but the Inquisitor leader. Now Ingo activated his Mortificators again and they charged forwards throwing grenades and blazing away with their pistols. 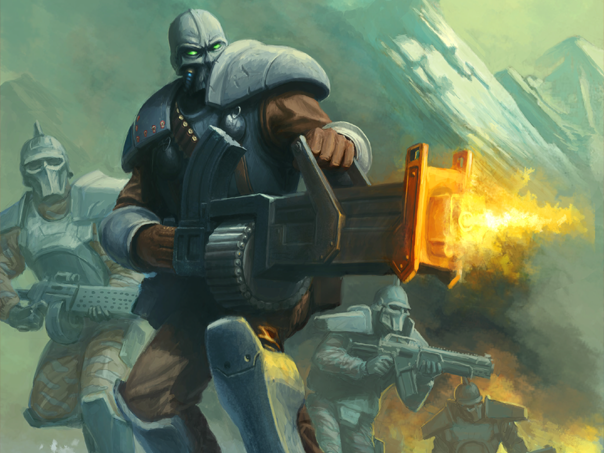 The first used a flame-thrower like ability to toast the Demon Hunter squad leader and kill a Necromutnat. The others managed to kill the remaining Ronin and inflict a massive 4 wounds on the Mishima Warlord. His resuscitator failed to kick in and he was dead. At this point we had to call it a day since one of us had to leave. While we had already played a couple of hours, we had only gotten into the second round, but it was clear to see where things were going. Ingo had only lost his troopers and I about a third of my points. 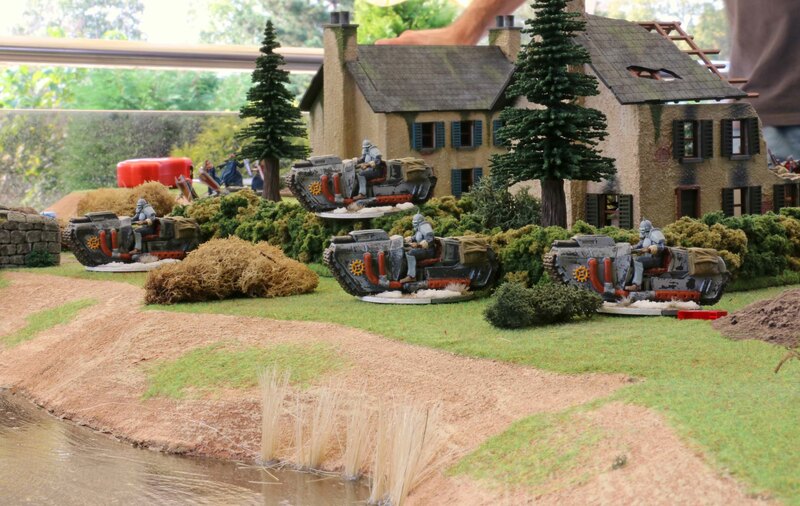 While my Warlord was in a pretty bad shape, we were sure that he would be able to take care of the Shadow Walkers with some help of the Hussars, especially since the Mortificators were releaving the pressure on him. The Brotherhood Warlord was still in mint condition, protected by his best troops and his Guardiani Oblati bodyguards still undeployed. On the other hand, Arnd had lost more than ¾ of his force and was left only with a squad of Hatamoto and half a squad of Demon Hunters. Andreas was better off. Galgotha was in as bad a shape is the Bauhaus Warlord, but presented a good target. His two remaining Nasca Razides were down to one wound each and we all agreed that the Praetorian Stlakers would not last a round, if my Vorreiter were to activate first. So we all agreed, that this would have resulted in a win for team good! All in all it was a pretty bloody fight, especially since team evil decided to concentrate its fire on one flank, virtually ignoring the other. In can not speak for the other team, but I had a feeling that Bauhaus and Brotherhood paired quite well. For the first time I had the feeling that Bauhaus really packed some punch in this combination where the other side was not able to influence me as much with their cards. Having already seen the revised Bauhaus cards, I think they shall do fine on their own in the future as well. Oh and for those interested, we played with the V1.3 errata of the rules previewed last week. 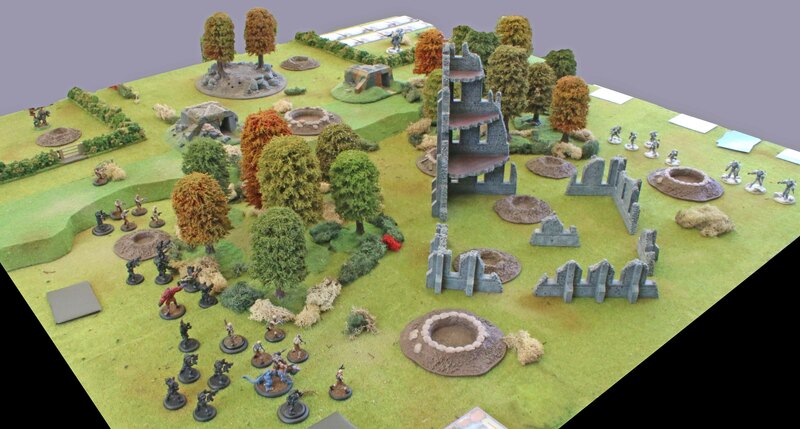 Last week on Tuesday, I had my third an pan-ultimate game in our Warzone mini league (yes it really is that small this season). Michael came over for a game and this would be the first time I would face the Dark Legion in our league. I decided to stick with the unit composition I had used in the game vs. Ingo two days prior. 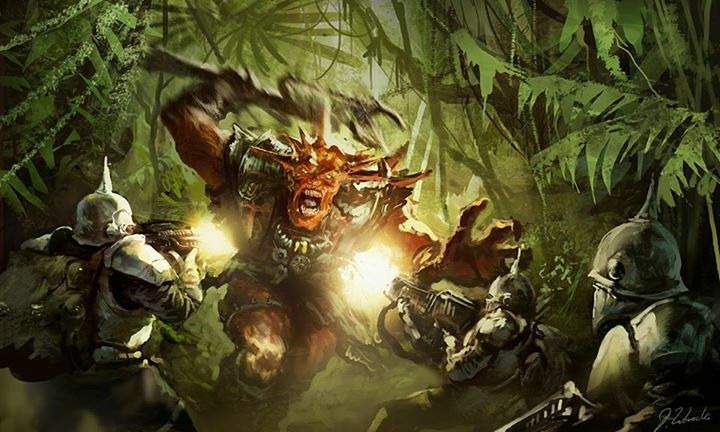 So again the Fenriswölfe were led by a custom Juggernaut close combat Warlord, with two squads of Hussars (one with six men and one LMG the other with just five men and no support weapon), two five-women squads of Etoiles Mortants with a flame thrower each, one five-men squad of Venusian Rangers with one rocket launcher and a three-men squad of Vulkan suits (all with Rapid Deployment, one of them in close combat configuration). Michael had his troops led by custom close combat Nepharite Warlord, with another custom Nepharite Lord. 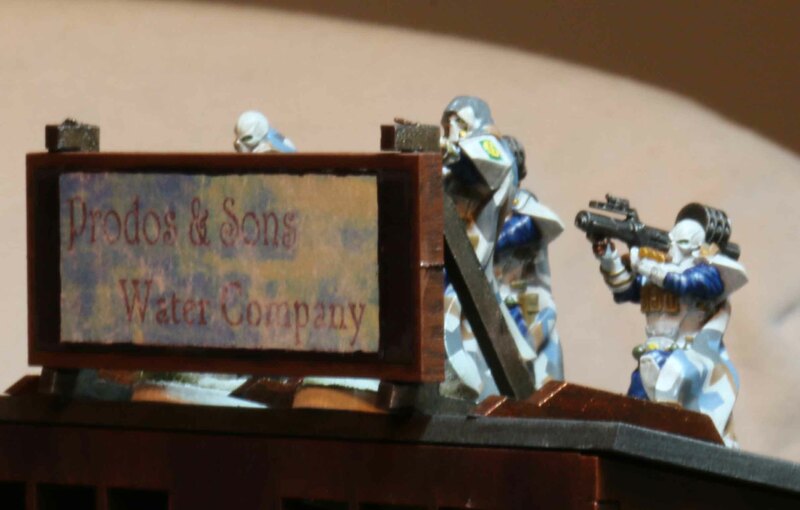 There were two seven-men Squads of undead Legionaries (each led by an extra Necromuntant and sporting and LMG and flamethrower. 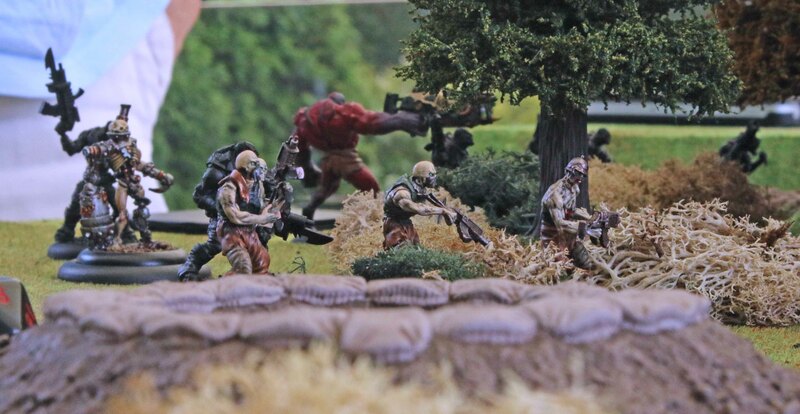 There were also two six-men squads of Necromutants, a lone Nasca Razide and two Praetorian Stalkers (ranged combat version) to round the force off. We had several missions to accomplish in this game. The primary mission for both sides was a “kill them all”, which I think speaks for itself. As a secondary mission we had to find and blow up an ammo dump. For the Corporate Agenda mission the Dark Legion had to capture two of my men for interrogation (or possible worse), while one of my squad leaders (the Vulkan leader) had to kill more enemy soldiers than any of the other Bauhaus squad leaders. 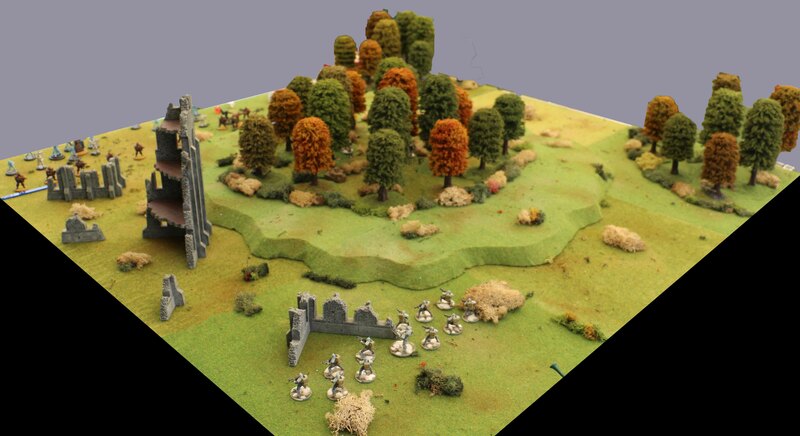 The table was kept fairly simple (due to the good weather I decided to set up outdoors last-minute) with a large wooded hill in the centre, two woods in the corners and a large ruin along one table edge. I had lost set initiative and put my Warlord with the two hussar squads in the corner facing the ruins. Michael put his Nepharite Lord into the opposing corner surrounded by one squad of Legionaries and behind a Necromutant screen. Further towards the middle he placed his Warlord with the Necromutants and behind those, the other squad of Legionaries. Between those two formations was the Razide. When it came to the infiltrating forces, I put my Rangers into the large woods in the centre, adjacent to one of the possible ammo dumps. My Etoiles Mortants and Vulkans as well as Michael’s Stalkers were kept off table to Rapid Deploy when called for. The first round literally started off with a bang. I activated my Venusian Rangers first, one of them investigated the possible ammo dump, found it to be real and set explosives to it to blow it up at the end of the round. 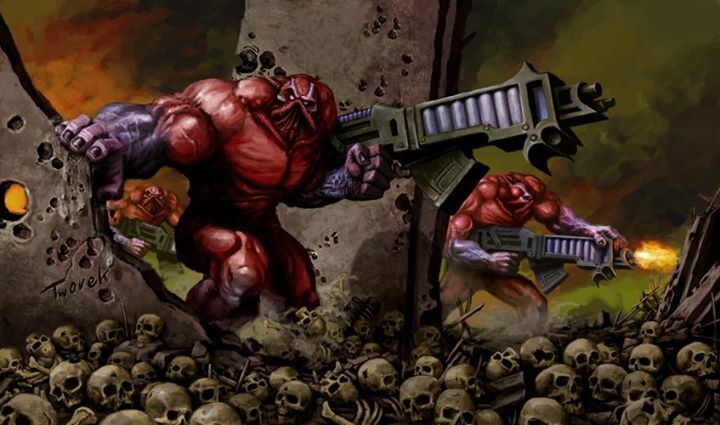 The other four squad members fired at the Necromutants accompanying the Warlord, killing one of them. Michael started by playing a card on me, that would turn all my weapons into plasma type weapons for this round. Usually this would be good for me, expect that Necromutants are able to heal quiet well vs. plasma weapons, which eventually meant I decided to delay any possible Rapid Deployments. Now Michael returned fire with his Necromutants but their fire was not as good although more men with a higher rate of fire fired (mostly due to me being in cover) and he managed to kill one of my Rangers. Otherwise it was mostly consolidating. My Warlord advanced with the Hussars. Michael’s flank Necromutants advanced while the Legionaries in the centre tried to keep up with the Warlord and Necromutants to their front. On the flank the Nepharite and Razide went into sentry, while the Legionaries huddled around them and put up a wall of fire with the flamethrower. They were pretty afraid of my Rapid Deployment troops. The next round saw my drop my Vulkans close to the enemy Warlord. They were right on spot and the squad leader and the other suit in range combat configuration were able to kill all the Necromutants surrounding the Warlord with their flamethrowers and HMGs. Now it was time for the close combat version to charge the Warlord in the back, but unfortunately he did not roll as good and caused only two wounds. But all in all things did not look too bad. Three suits in mint condition and not much to do them harm… What could go wrong. Well as it would come to show, a lot. One after the other, Michael’s Praetorian Stalkers dropped close to my Vulkans. One of them botched up his drop, but was still close enough to attack. Their weapons came with a flamethrower that is pretty effective vs. vehicles. So instead of getting a good chance for an armour safe (Vulkans have a 13 and 14 target number on a D20) it got down to a 5% chance. I was still able to prevent some damage due to good dice rolling and their auto repair function, but bottom line was… They all could no longer take more than minimal damage. For the rest of the round they were fired at by the remaining squad of Necromutants and the Legionaries. 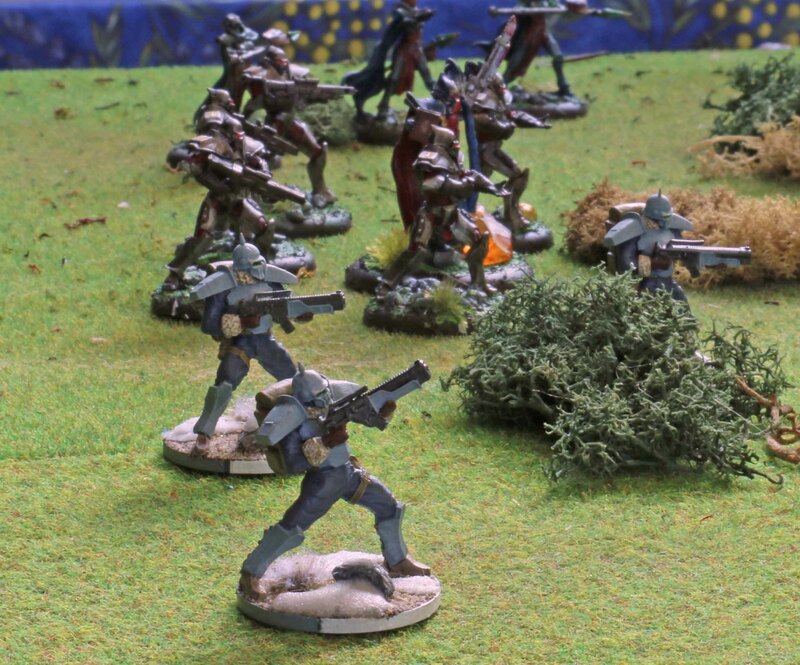 Some of the closer Legionaires also charged them… Undead claws are pretty effective vs. armour, too. In the end all Vulkans perished and with them more than a third of my points… Ouch! In the corner the Dark Legion was going back to its corral tactic. So my Etoiles Mortant went in for high risk drops (only the slightest scatter would have meant disaster for them). The drops went fine and between them, they managed to kill both the Nasca Razide and Nepharite and a good portion of the Legionaries. Unfortunately, one of the living corpses was able to pick up the flamethrower from his now more than undead partner. When their turn came he manged to toast all (including the flametrower) except the squad leader from one squad. One of the undead also a manged to kill the other flamethrower. Otherwise my Warlord and Hussars advanced further. The next round, my Etoiles Mortants cleared off the remaining Legionaires, but at a grim cost. When one of them slew the Necromant Leader in close combat, his body fluids splashed over one of the Etoiles, turning her into an Undead Legionary as well, who had to be killed by her former mates. For protection, they also threw some flash grenades, but during the rest of the turn they were still picked of my fire from the Necromutants. In the centre, my Rangers were falling to fire from one of the Praetorian Stalkers and remaining Legionaires until only one of them remained. But the big blow was with to come to the troops accompanying my Warlord. By playing a card Michael was able to teleport one of his Stalkers back to their “mothership”, only to instantly rapid deploy him again right besides my Hussars and Warlord. He also played a card which turned the armour on the bigger of the two Hussar squads extremely hard, except for the weapons type the Stalker was using. In the end a total of seven Hussars perished with my Warlord taking minimal damage. The remaining Hussars did their best to take down the Stalker, but failed, so in the end my Warlord had to turn on him and kill him. What did this leave us with? Well Michael had little under half his force left, while all I had was my Warlord, four Hussars and a Venusian Ranger. I had achieved my Secondary and Corporate Agenda Missions, but there was a snowball’s chance in hell that Micheal would not take the primary one. So right now it was a draw. At least if I could keep him from completing his secondary mission as well. (Yes, we played this wrong. If we both have the same secondary mission, only one can achieve it and since I had already blown up the ammo dump, this would have been the case.) so I shifted my aim to blow up his ammo dump as well. My Venusian Ranger was killed while he crouched next to it, waiting to place his explosives. Two Hussars were killed in a blocking position, while the other two were cut down en route. I also managed to kill two Necromutants, but this was of little consequence. In the end it was a head to head race between my Warlord and one of his Necromutants to see who would get there first. Since we were both the same distance from the ammo dump, one initiative roll would see who of us would activate first and therefore set his explosives first. Micheal won that initiative and therefore made sure it was a win instead of a draw. But a narrow result it was none the less and a very fun game! First of all, sorry for the lack of posts over the past 1 ½ weeks. 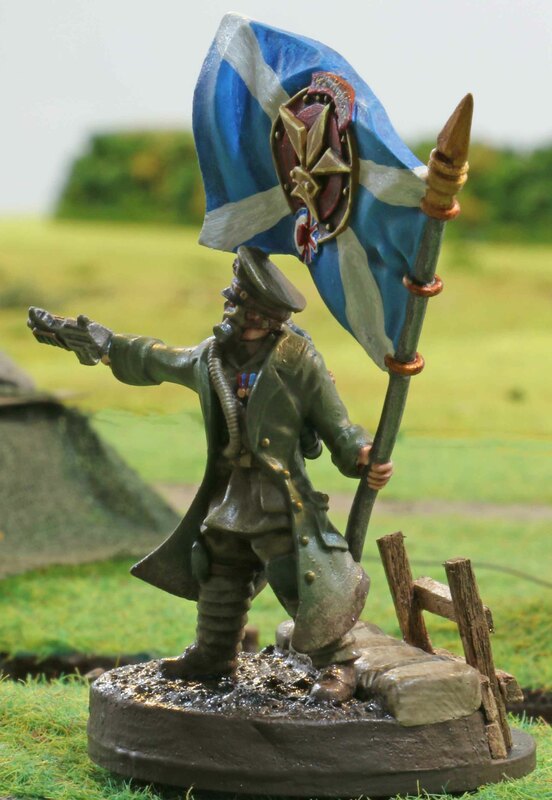 The weekend before the last, I was pretty busy translating rules from English to German (maybe more on that in about a month time) and after all that time spend before the screen, I simply wanted to spend time with Sami and painting minis instead. But there will be some catching up this week. The other mini is Valpurgius for the Dark Legion faction. The Dark Legion is made up of various Dark Apostles, one if which is Algeroth, the Apostle of War. One of his mightiest followers is this Valpurgius, a grand magus, skilled in the Dark Art (essentially psy powers) as hardly one other. 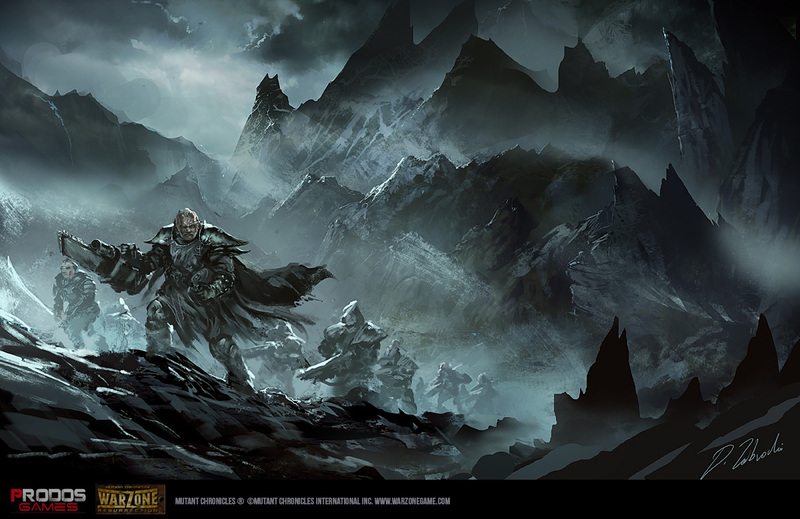 In game terms he is one mighty miniature, but also the most expensive Warlord of them all. All that being said, the miniature is extremely cool, so I simply had to paint him up. 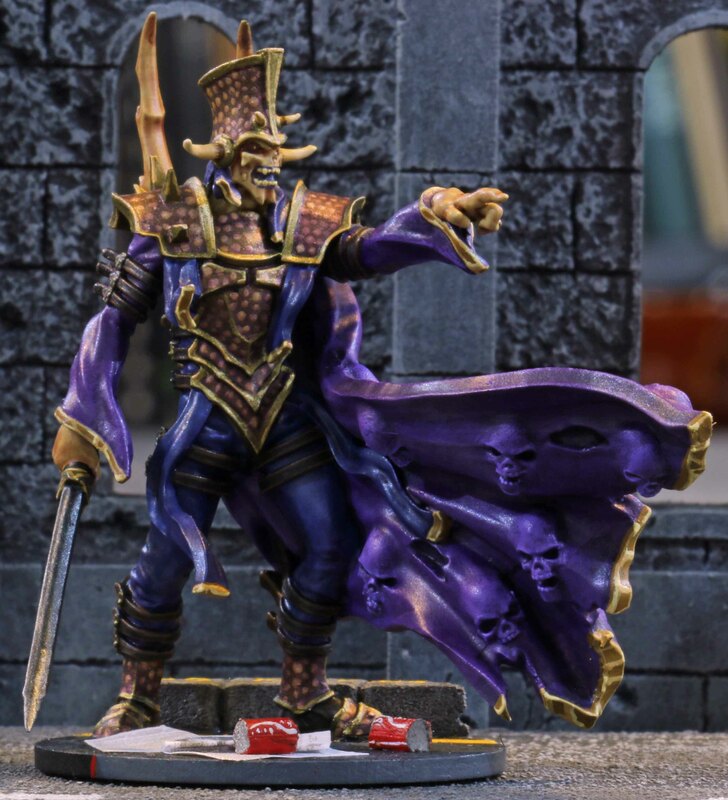 I stuck close to the original Paul Bonner artwork (his art was the second big motivator that got me into Warzone almost two decades ago), where he is depicted in robes of purple and purplish blue as well as purple emailed armour. 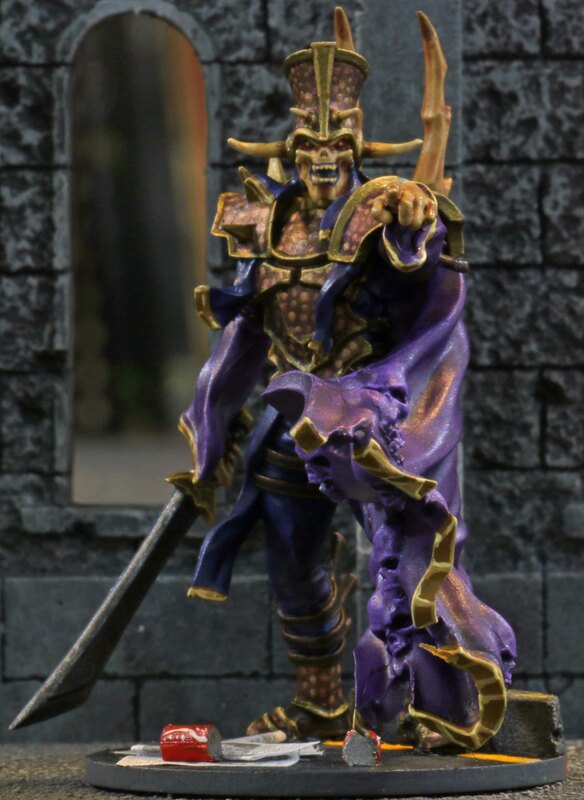 I really enjoyed painting the face and the skulls formed by his dark magic in his cloak. 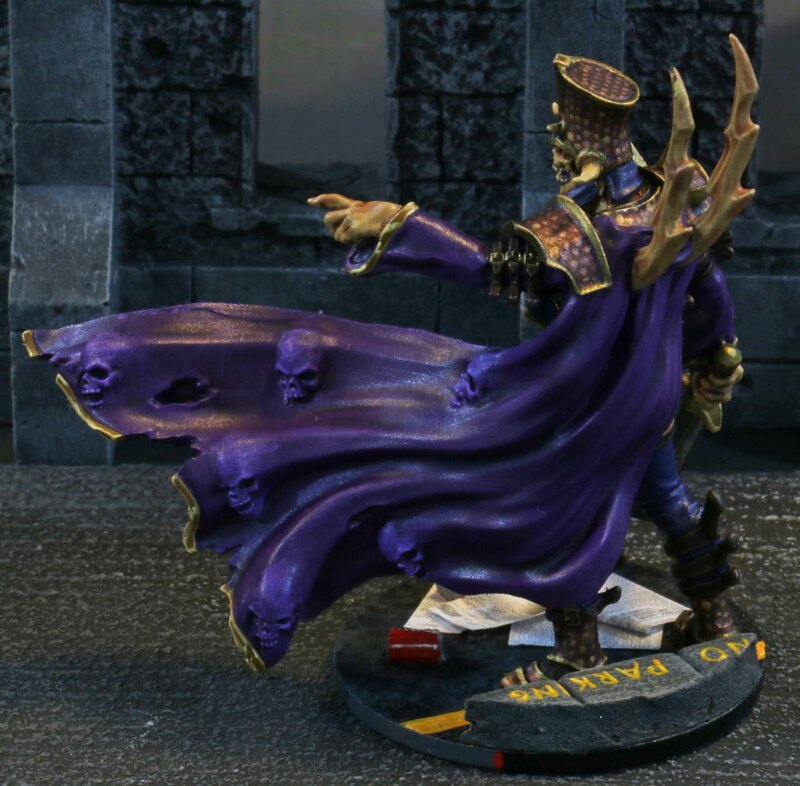 The sculpting of this mini is just exceptionally nice. I contemplated for a long time how to base him (and therefore the rest of my Dark Legion forces). Someone on Facebook suggested rubbish and I liked that idea in a certain sense. One thing that always touches me about post apocalyptic movies is the newspapers, trash and other derelict items of human life strewn on the streets. I felt this would be quite fitting for the Dark Legion with their hordes of undead and other abominations invading the habitats of humanity to exterminate and enslave it. Again all the base is scratch build. Up next I will try to post some game reports, so stay tuned. So today I played my first game of Warzone Resurrection against Andreas´ Dark Legion. It was a fairly small game with 750 points for each side and just the standard OOB. 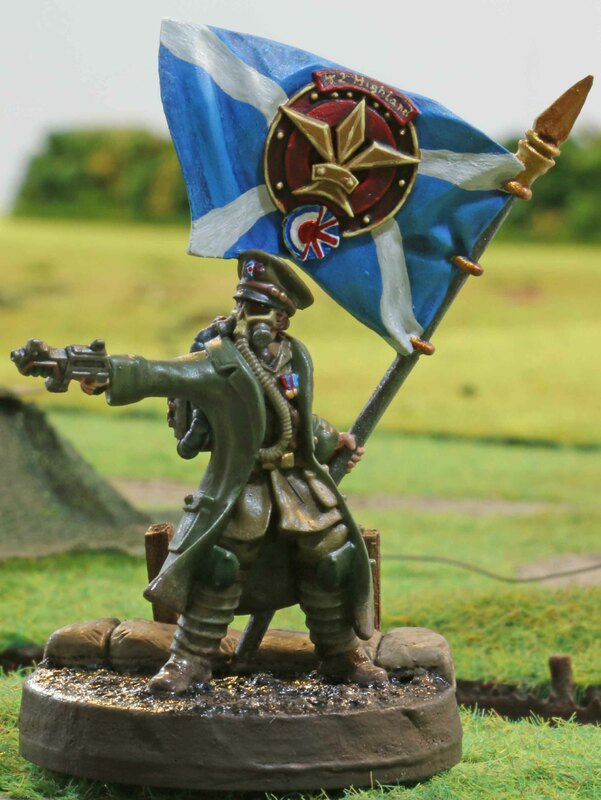 My Bauhaus troops were led by Max Steiner and consisted of two squads of Hussars (one 5-men with rocket launcher and one 6-men with LMG), three Armoured hussars and a Vulkan. Andreas´ forces were led by a custom warlord and consisted of two squads of Undead Legionaries lead by a Necromutant each, two squads of Necromutants, two Razides and a Necrobeast rider. We played the fighting withdrawal scenario, which essentially meant, that we both had to try to get our forces off the opponents table edge. So far so good. And how did it go? Well not so good for me! Max Steiner had deployed in a foxhole slightly in front of the troops, leading from the front. I quickly had to find that even hard cover, camouflage and LOS drawn through yet more terrain is no guarantee for survival. So while he was waiting to spring the trap on the advancing enemy, he received a wound from a Razide (who can ignore terrain when firing), topped of by two Undead Legionaries who rolled natural ones (which means no saves and no heal rolls). So he was dead before he even fired a shot. Otherwise there was not much action there since virtually everyone else was out of range and just advancing. Except for the second Razide, who gave my Vulkan two critical hits to the engine. The second round saw initiative go to the Dark Legion. The first unit to activate was the Razide and not wanting to lose my Vulkan I played a card that reduced its rate of fire to zero. So Andreas bumped that up to at least one shot by spending a resource card and lo and behold… two more critical hits on the engine and kaboom went the Vulkan. Which meant points wise, I was just 60 points short of having lost half my force. It about went on like that. I activated my Armoured Hussars only for Andreas to lay a card that did not allow them to fire any weapons that turn. So I put them on defensive mode (bumping their armour to maximum) and advanced them into a better position for next round. Only to have two of them killed by Necromutant assault rifles. The next round the remaining Armoured Hussar charged the custom Warlord through the walls of a large ruin (there is a reason these are called Juggernauts) only to be overcome by his fear of the undead on the other side and doing no harm, but being shredded apart be the Necromutants. Now I was down to less than a third of my points and had not caused a single casualty. But at least now my Hussars were moving into firing positions. But this did them no good. while the ones on my left flank at least managed to pick off one Legionnaire, they were slowly mauled by the crossfire coming at them from three directions. Not that their mates on the other flank were better off. 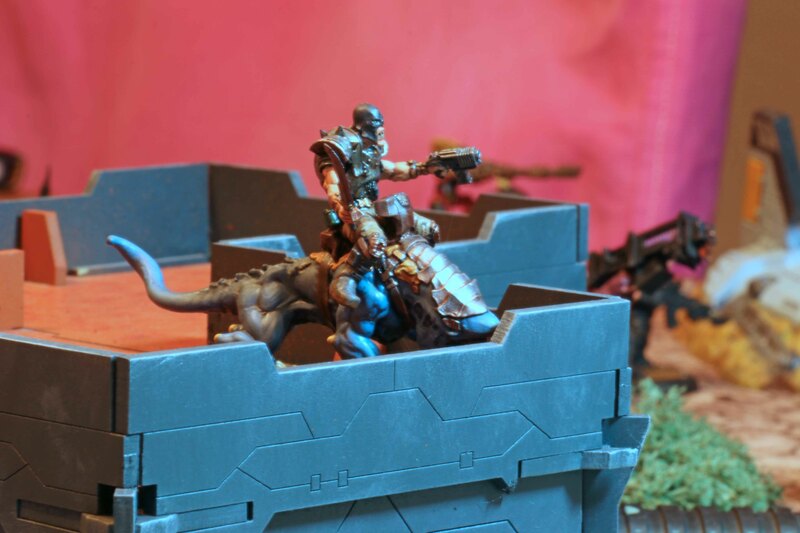 They received some flank fire, but took it in stride only to be charged by the Necrobeast rider. It was a real monster in close combat and it moved through the rank and file like a hot knife through butter. In the end only the trooper with the rocket launcher remained and managed to get off two shots (over tow rounds) at paint blank range at the beast, but one of those got caught up in its armour. After that, he two was killed. Shortly after we called it a day, with me only having one Hussar on the table (the only mini who constantly seemed to roll good). On the other hand I had only managed to cause some minimal damage to the Necrobeast and killed one Legionnaire. I guess this was a resounding victory for the forces of evil who now marched on…. All in all I can say, I have had more pleasant first games, but those are the whims of the dice! But Andreas was great to play with and I learned a few things (in addition to “do not roll below average, when your opponent rolls above average”). Amongst them is that no amount of cover of camouflage can save you from natural ones, so never deploy your Warlord in an advanced position on his own, even if it is a great position. Oh and expensive units can just as easily be gone before they even did a thing! Anyway, I am going to leave you with the panorama shots of the table. Lets see how next weekends league game is going to go!